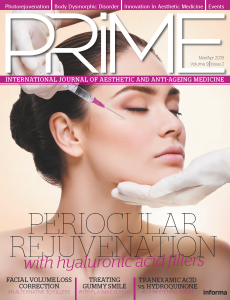 PRIME is the leading authority on aesthetic and anti-ageing medicine, providing industry news, insightful analysis and key data, as well as the most high quality peer-reviewed research articles in the market. It’s because of this that PRIME attracts leading authors who provide authoritative analysis of the issues that matter most to the industry. Published both in print and online, with territory-specific content for the European, North American and Asian markets, PRIME is an essential tool for physicians, surgeons, dermatologists and practitioners alike.